So, you have finally been able to bring your girl gang to agree on a destination for that long overdue all girls’ time out, and that too to Mauritius! Wow! Great choice and well done on making all the other girls finally unanimously agree on something! Now you have the responsibility and stressful task ahead of you to plan the trip in such a way that each and everyone will enjoy. What can you do with your girl gang in Mauritius? Well, this is where I am going to be your mentor! Having already spent years enjoying Mauritian life, I am going to tell you some insider’s tip which will make your stay there all the more enjoyable. The sea, sand and sky combo! Gorge on the three elements just because you are on an island duh! While most tourists will simply strip down to their swimming costumes and just get that refreshing swim in the calm lagoon and get a tan afterward, you can get all of this and more by going for a catamaran cruise! Yes, that’s right! There are many catamaran cruise agencies in the north of Mauritius which have special group packages which comprise of… are you ready for it? Sand element – The catamaran will bring you to one of the most beautiful tiny islands in the north of Mauritius, Ile Aux Cerfs! There you can get that well-deserved tan (don’t forget your sunscreen!). Roam around the island buying cheap whatnot. And girls, there is a bar! Yes, you can get your drink game on because you will not drive. This is where you can click most of your make-my-Indian-people-jealous pictures. The pictures found on the internet do not do justice to the splendour of that scenery! An all girls trip without a tripping nightlife is not always worthy! The best nightlife is in Grand Bay, which is in the north of the island. Recently there has been a shift at Flic en Flac (breathe easy, that’s a popular beach in Mauritius and not an English phrase which you never knew) but I’d still recommend Grand Bay because it retains the Mauritian flavour while Flic en Flac reek of tourist trap! Do a quick search by asking your friend ‘Google’ or as I would rather do by stalking Mauritian event managers on Facebook. They do a good job at posting upcoming events, and karaoke nights (which you do not want to miss!) One thing which you should not miss is Sega nights. There are several clubs which are beach facing so that there’s room for Sega dancing on the sand. 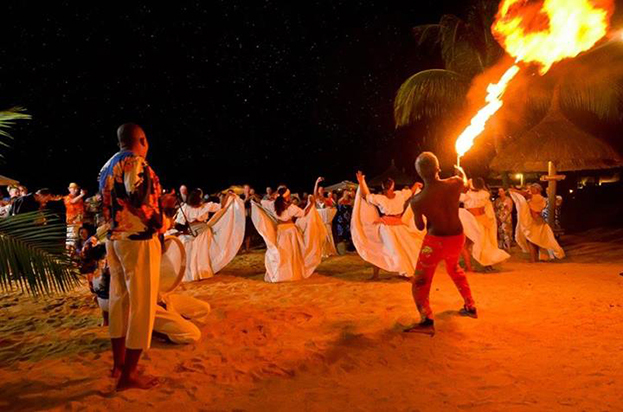 Sega is the Mauritian own dance moves, so swing that hip and wave your hand for a whoop like you don’t care. There is no Uber nor Ola service currently in Mauritius so it would be wise to ask your hotel to book a taxi for you for all your travel needs around the island. You and your girls deserve a time out to just be free to eat their heart’s content. Mauritius is the perfect place to taste a variety of cuisine since the island’s population is multi-racial and so is the cuisine. The street foods are the best! Dhol Puri, samoussas, kebab, fruit salads, fried noodles/rice and my favourite boulette (which is a much better version of Indian (actually, Tibetan) Momo!). Did you say relax time? 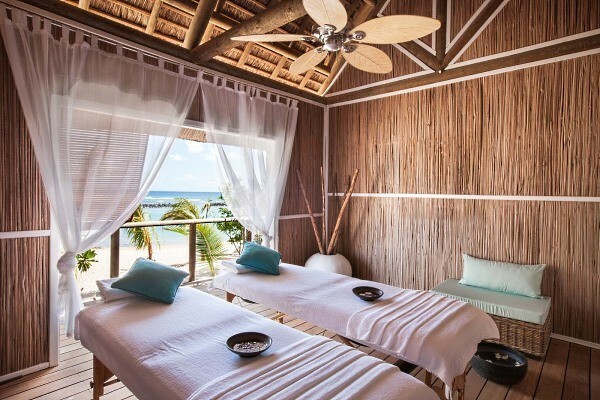 Well, you can squeeze in some spa treatment at your hotel or choose one of the spas around. The island is such that you can get to any part in less than 2 hours so do not worry about travel. Read online reviews for different spas and get a group package since it will be at a discounted rate. One thing which I might remind you is that the direct flight cost to Mauritius is significantly higher than if you take flights via Dubai or Kuala Lumpur. I would say, save those pennies and spend them on getting a better time in Mauritius, even if the connection time between flights is a few hours. Firstly, Dubai and Kuala Lumpur airports are worth exploring and secondly, when you have your gang around, masti is always on the cards. Finally, while Mauritius is one of the safest countries in the world with a very low crime rate, you can’t ever be sure enough. Always buy a good travel insurance for your gang before you leave. You know how crazy you girls can be at times and a decent travel insurance will keep you protected. What is travel insurance? Basically, this is a useful insurance policy which protects you from untoward incidents during your trip. The premium needs to be paid once, and the coverage is active during your whole trip. You will be protected from the elements which you can’t control, like the airlines losing or damaging your baggage or you need emergency medical evacuation to India. You will also be protected against any medical bill, hospitalization costs, injury benefits (don’t fake it!) and God forbid, the death benefit. Frankly, for a little premium, you will ensure that you (plural you, meaning the gang) are well protected from almost everything. That’s it. You can now choose the date and select the flight. 70% Mauritians are of Indian origin and they all speak and understand decent Hindi/Urdu so yes, whenever you want to say, chalo, thik hai… they will understand you perfectly. PS: This is a sponsored post and it contains an ink. You wont be charged if you click on these links!